B&H has the newly released 3 Legged Thing Dedicated L-Bracket for Nikon Z 6 and Z 7 Cameras in stock with free expedited shipping. 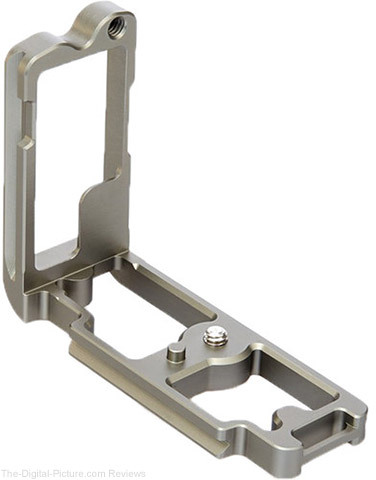 Note: Also in stock – Really Right Stuff Ultralight L-Bracket for Nikon Z 7 and Z 6. Expected in 7-10 days – ProMediaGear L-Bracket and Kirk BL-Z L-Bracket. British Tripod Manufacturer and Lucie Technology Award winner, 3 Legged Thing, announces the release of Patti, a new Punks tripod. 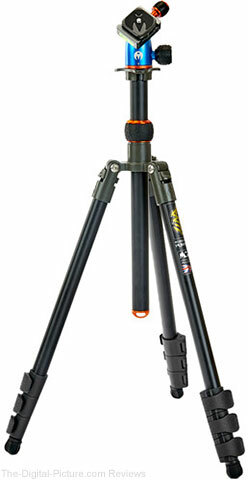 3 Legged Thing is excited to announce a brand new addition to its Punks range of tripods. Patti, named after Punk legend Patti Smith, is an incredibly capable general use tripod, and the company’s first full size tripod priced below £100. Boasting a higher maximum load capacity than is usually found in tripods of this class, Patti is able to support up to 10 kg / 22 lbs of camera equipment. This is due to Patti’s secure flip leg locks. Formed from rugged hard-wearing ABS plastic, the flip locks have a smooth action which secures the legs into position. 3 Legged Thing Punks Patti flip lock Perfect for photographers of multiple genres, and adaptable to a wide variety of situations, Patti is an ideal starter tripod for users of compact, bridge, mirrorless, and lightweight DLSR cameras. 3 Legged Thing CEO & Founder, Danny Lenihan, commented: “Patti breaks three barriers for 3 Legged Thing – the first tripod we have named for a female rockstar, the first to have a flip-lock mechanism rather than friction locks, and our first tripod to retail for under £100. Patti is made from aircraft grade magnesium alloy and features a single-section centre column that is both removable and reversible. The tripod’s three optimal leg angles (23 ° 55 ° and 80 °) give photographers greater versatility, allowing them to undertake shooting as low as 11 cm / 4.25 “ from the ground. Maintaining its versatility and ease-of-use, Patti ships with a new, simplified ballhead – the AirHed Mini – which features just two controls; the release plate clamp knob, and a combined panning and ballhead tension knob, which allows photographers to make composition and position changes using a single control. 3 Legged Thing AirHed Mini With a single column section and four-section legs, Patti is just 45 cm / 17.7” long when counter-folded yet extends to 1.63 m / 64” making her an ideal tripod to carry for a broad range of photographic uses. Patti also features 3 Legged Thing’s patented Tri-Mount plate, which enables a compact profile when counter-folded, and includes 3 hollowed spurs for the attachment of accessories. Patti is available in two colours – Punks grey with blue AirHed and accents of copper, and Punks Anarchy matte black with accents of British Racing Green. Patti ships with rubber Bootz which are detachable and can be replaced with 3 Legged Thing’s range of footwear – Heelz, Stilettoz, and Clawz (available separately). Patti is available to pre-order now ahead of a worldwide release on 15th September. Suggested retail price is £99.99 UK / $119.99 US. Patti will be on show at Photokina 2018 in Cologne, along with 3 Legged Thing’s range of professional tripods, monopods and accessories. Visit 3 Legged Thing in Hall 2.1 on stand A25/B26. 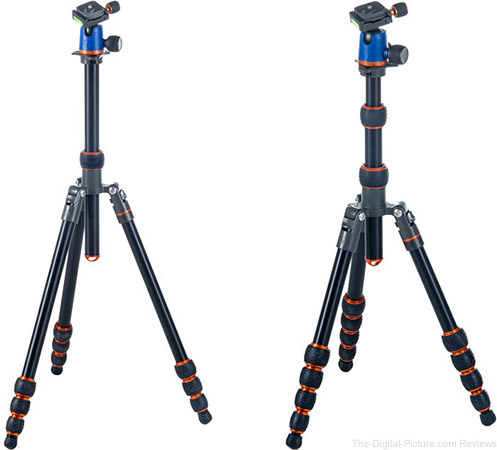 B&H has the 3 Legged Thing Patti Tripod available for preorder. Complementing their highly-acclaimed range of tripods and accessories, and inspired by the Bletchley Codebreakers and 90s industrial metal (there’s a sentence you never thought you’d read), 3 Legged Thing has announced the release of Alan, a rugged carbon fibre professional monopod; Trent, an ultra-tall Punks monopod; and Docz; a foot stabiliser that works with both monopods, and which is also available separately. The perfect blend of size, weight and capability, Alan is built for versatility and resilience. Ideal for action and sports photography and to add stability when creating video footage, Alan has a stored height of 45 cm / 17.5 ”, and is compact enough for transportation in hand luggage. Alan extends to a maximum height of 1.49 m / 58.7 ”. Formed from 8 layers of 100% pure carbon fibre and aircraft grade alloys, ensuring he is both light and incredibly strong, Alan can support a maximum load of 60 kg / 132 lb – almost 100x his own weight! Both ends of the monopod feature dual 1/4”-20 and 3/8”-16 threads allowing Alan to connect to a variety of accessories, and to be used as a camera or microphone boom. The patented Tri- Mount plate has three hollowed spurs for the attachment of accessories, and the unique Big Grip provides maximum grip for security and has deep channels designed to disperse moisture. Punks monopod Trent’s full extended height is over 2 m (80”) making him one of the tallest monopods in the world today. Formed from aircraft-grade magnesium alloy, Trent is both strong vertically, and is capable of lateral loads making him ideal for use as a camera or microphone boom. Trent’s maximum load capability is 30 kg / 66 lb, giving him an impressive load-to-weight ratio of 50:1. Trent features 3 Legged Thing’s unique Bubble Grip technology on the leg locks and column grip. This offers users improved leverage, and maximum grip in inclement weather conditions. Like Alan, Trent also has dual 1/4”-20 and 3/8”-16 threads at either end allowing for use with a variety of accessories. Both Alan and Trent have a detachable rubber Boot at the bottom, which can be replaced with any of 3 Legged Thing’s footwear – Heelz, Stilettoz, and Clawz – or can be used with the new foot stabiliser Docz. 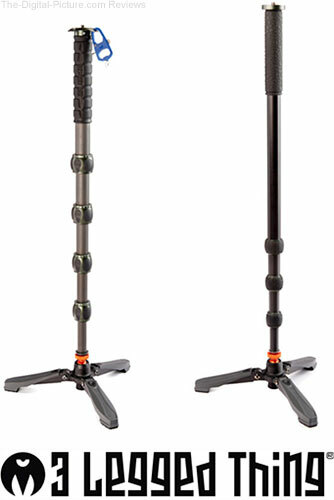 Docz is a rugged foot stabiliser with a 30 cm /12 “ base, designed specifically to add stability to monopods. With an alloy base construction, a rugged ABS top cover and rubber boot adjuster, Docz adds a stable, solid base for monopods with no flexing. The rubber adjuster controls the friction and tension settings on Docz’ ball mount, enabling an ultra-smooth motion for action and sports photography. The ball mount has a 3/8”-16 thread, and can also be locked upright for extra stability. Trent features 3 Legged Thing’s unique Bubble Grip technology on the leg locks and column grip. This offers users improved leverage, and maximum grip in inclement weather conditions. Like Alan, Trent also has dual 1/4”-20 and 3/8”-16 threads at either end allowing for use with a variety of accessories. Docz is a rugged foot stabiliser with a 30 cm /12 “ base, designed specifically to add stability to monopods. With an alloy base construction, a rugged ABS top cover and rubber boot adjuster, Docz adds a stable, solid base for monopods with no flexing. The rubber adjuster controls the friction and tension settings on Docz’ ball mount, enabling an ultra-smooth motion for action and sports photography. The ball mount has a 3/8”-16 thread, and can also be locked upright for extra stability. Docz legs can be folded upwards, creating a more compact footprint for transportation. All products are available to pre-order via retailers worldwide, and will ship in time for the official release date of 1st August 2018. The all-new tripod range, PUNKS by 3 Legged Thing are out now! Travis, the everyday use tripod, and Corey, our ultra lightweight micro travel tripod are packed full of 3LT innovation, including a detachable monopod, the patented Tri-Mount Plate for multiple accessory attachments, plus much, much more. All that is left for you to do is, choose your weapon. Corey is a new generation of micro traveller tripods. Packed full of features, with extraordinary functionality and capability, the new Corey tripod is a culmination of 2 years of design and development. With 5 section legs and a 2 section column, and an AirHed Neo, Corey extends to a good working height, whilst retaining the ability to fold down to an incredibly compact size for stowage. With a load capability of 14kg / 30lbs, Corey is the perfect combination of weight, size and capability for photographers of all genres and abilities. Travis is the first Punks tripod designed for every day use. Packed full of features, with extraordinary functionality and capability, Travis will appeal to any photographer looking for a great all-round tripod. With 4 section legs and a single column, and an AirHed Neo, Travis provides exceptional stability and rigidity, and a load capability of 18kg / 40lbs. Perfect for photographers of multiple genres, and adaptable to almost any situation, the new Punks Travis is an excellent multi-purpose tripod for general use. B&H carries the 3 Legged Thing Travis and Corey tripods.